So here we are... in another season of frustration and thinking what could have been for the Rocks. 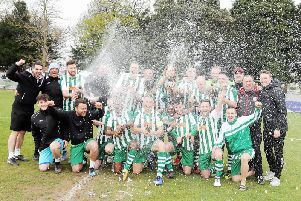 I started supporting Bognor when I was invited by a schoolfriend 20 years ago, and as at most clubs there have been some ups and downs over the years – but the past two seasons, in my opinion, have been a bit of a mess. The club seem to make giant strides forward in many ways, largely thanks to a group of volunteers who know who they are, as seen with Rocks Radio, highlight packages and one of the best club shops in non-league. But on the pitch and behind the changing room door, it seems to a large majority of fans it is just so backwards. I recently went on the Rocks message board to see a thread entitled ‘Next season, what do people think?, and it was alarming to see the number of fans who were considering finding their Saturday fix somewhere away from Nyewood Lane because of the direction the club is going. There are a number who spoke with their feet this time last year and have not been seen since and this cannot be good. Rewind to last season in the National League South – what a buzz there was going into the season. Yes Jamie Howell had gone and we all laughed and joked about the three-month search for a manager just to announce our captain, Sami El-Abd, in the hot seat as pre-season started. Jack Pearce wanted to “give it a real go” but for whatever reason El-Abd stood down and Pearce decided that after more than ten years away from the dugout, he fancied the challenge. It didn’t take very long to realise (in many people’s opinion) he wasn’t up to said challenge and fans demanded changes. A Sunday morning forum was called in which fans were promised a six-week review of the managerial role. Sixteen months have since passed, as has one of the most embarrassing relegations imaginable, and we still find ourselves under the same manager. Robbie Blake has come in and there is a lot of love out there for what he’s done, but what’s he working with/against at times? A very loyal group of fans, myself included, get very frustrated when the manager/chairman comes out and says things such as “The fans are unrealistic”, “they need to accept Worthing is a bigger club”, “they’re not suggesting players to sign”. These sort of comments put up a massive divide and will ultimately drive fans away. This seemed all too familiar, wasn’t this the feeling I had in April 2018? Then, all of a sudden I had an image of Phil Connors (Bill Murray) in my head reliving the same day over and over again. Yes, It’s Groundhog Day and I think we may be reliving this day once again next April if changes aren’t afoot ahead of the new season.